January 20	Intentions Combine paper, paint and imagery and text to create a beautiful visual mantra for your coming year. February 10 From the Heart Create a heart-felt tribute to things or people near to your heart using mixed media - and lots of love! March 24 New Beginnings Hibernation is over, looking forward to Spring, we create a mixed media piece to celebrate and encourage new growth, new life and new beginnings. April 28 Abstract Triptych (3 pieces in one) In this fun new class we create 3 small pieces that work together with color, design, composition and emotion. “Mix and match with mixed media!”. A few shots from my October and November Mixed Media Workshops. Plenty of creative energy both sessions- it seems like it is the perfect season to come inside and explore one’s creative side! Next Mixed Media Workshop Coming in January, 2019! As summer gives way to the changing season, take a look back at a special memory or vision. Learn and practice various mixed media and acrylic painting techniques, while creating a personal creative expression which reflects you. $75 for materials and instruction in a comfortable studio setting. Join us at ASiF Studios in Grass Valley for this creative afternoon with like-minded souls as we roll up our sleeves and connect with our creative side. No experience necessary. If you have any questions, please feel free to contact me. We have just returned from our most recent art retreat in beautiful San Miguel de Allende, in the true heart of Mexico. Guanajuato state is nearly the geographic center of Mexico. Our group of 13 enjoyed a feast of sights and sounds, culture, history and art at every turn. During this retreat we worked on 4 different projects in mixed media and oil pastel. Here are a few snapshots of our fabulous week, which went by all too quickly. Working each morning in the beautiful courtyard in mixed media and oil pastels. "Taxi!" by Eileen "I love the energy of San Miguel de Allende." Liz working with the group in oil pastels. Discussing our work... Cityscapes in Mixed Media. Love Kathy's color scheme! Suzanne at Cañada de Virgen Pyramids, just out side the city. Just discovered at the end of the 20th century, we had a great tour- and a workout with the climb! Ok- just one more rooftop. Eileen, Bob, Kathy, Lilly, our assistant, and my partner, Liz Collins. We visited a total of 8 different rooftop cafe's, but didn't find all of them! Another reason to come back. This is my second trip to San Miguel de Allende and already it calls to me to return again. This piece includes many of the impressions of my experiences from my 2 weeks there. Ready to go again! 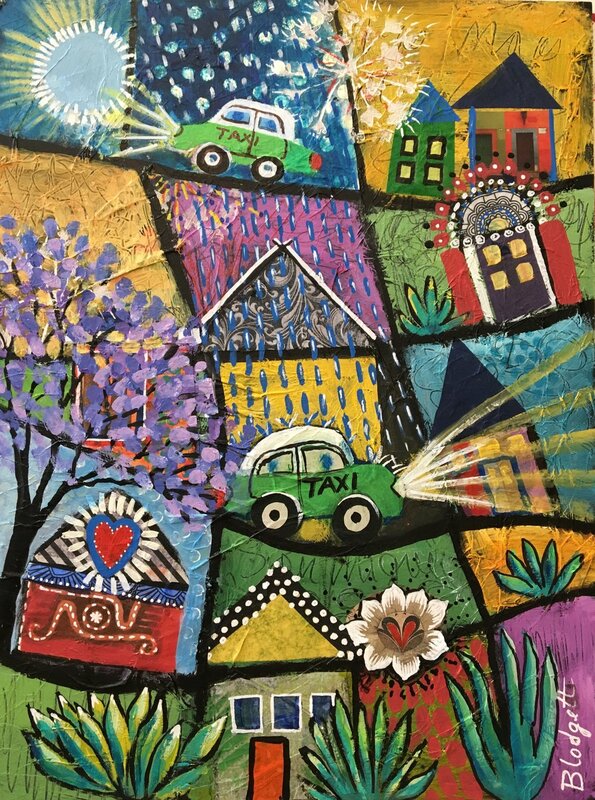 Eileen's vibrant series of totem-inspired paintings can be seen at Java John's at 306 W. Broad St., Nevada City during the month of March, 2018. All works are for sale and can be viewed during regular cafe hours: 8 AM-4 PM every day. My passion is painting and creating. I can never spend enough time in my studio, letting the colors, imagery and ideas flow. Time passes unnoticed and I am content. Mixed Media is all about layers of media used to create our expression on canvas. Acrylic paint, papers, recycled bits of our lives: love letters, old catalogues, sheet music, text, poetry, color, line, texture - or the appearance of texture… the list is endless as the process unfolds. Each unique - themed class introduces new techniques and ideas on how to use various tools and media on canvas. Like Mixed Media itself, participants come away with layers of new techniques and practices to create their own art at home. Join us in the studio as we build an original mixed media reflection of "passion" which reflects you! What are you passionate about? Perhaps it is all about being free to create, or a special person or friend. You decide! 11x14 or 12x12 canvas, paint and supplies are provided, along with dynamic professional instruction. Participants are strongly encouraged to bring additional personal collage materials to class, as well. Sorry... THIS Workshop is full. Please see February's Workshop: "Passion"
Create a night landscape using the energetic colors of Autumn. Join us in the studio as we build an original mixed media night scene which reflects you! 11x14 or 16x20 canvas, paint and supplies are provided, along with dynamic professional instruction. Participants are strongly encouraged to bring additional personal collage materials to class, as well. News from Sayulita Art Retreat! Just returned from hosting our 5th Art Retreat in Sayulita, Mexico from March 27- April 3. Everyone got straight to work on their mixed media pieces which were created in this beautiful jungle setting. Our “studio classroom” was the patio of our Balinese casa. Each day we were serenaded by the jungle birds and enjoyed balmy weather as each new project emerged. We were happy to welcome back 7 returning artist students this year and 3 newcomers. Here are a few shots of the week. Liz Collins and I enjoyed, once again, art in the jungle with friends. *Next Year we are bound for San Miguel de Allende! A new beautiful destination in one of Mexico'd oldest historical cities, a World Heritage Site filled with arts and culture. Using analogous colors, abstract faces, acrylic paint and personal icons, we created some new jungle friends. Great group of creative women! Sayulita Beach in the morning. Our jungle studio - turned margarita fiesta plaza! Liz Collins and I wish everyone a safe trip home, where their creativity can continue. What happens in Sayulita shouldn't stay in Sayulita! El Gallo Loco! Crazy jungle rooster I completed in Sayulita during our demos.